Helping clients and operators achieve success in the hospitality industry requires not only a high level of experience, knowledge, and expertise, but it requires a special understanding of the needs and challenges of that industry. At KROST, we have helped hundreds of restauranteurs, hoteliers, and travel professionals achieve their true potential and maximize profits. 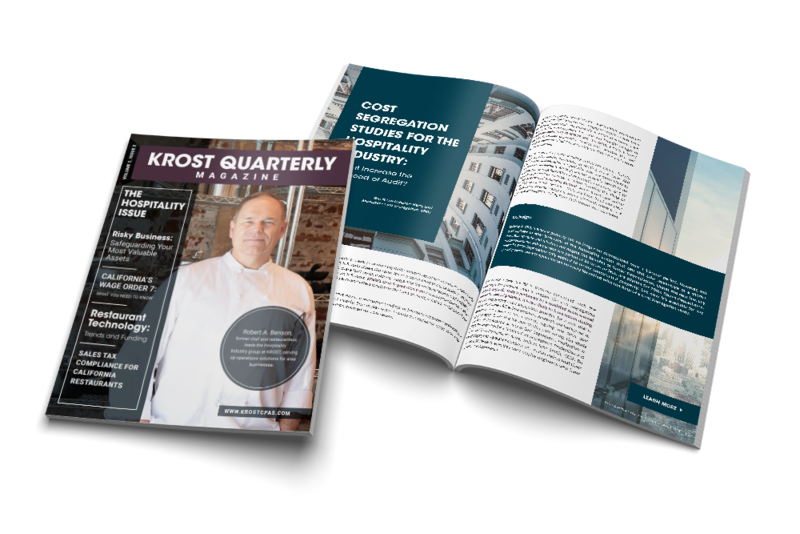 Check Out our KROST Quarterly Hospitality Issue! Just as the primary foundation of the hospitality industry is built upon customer service, we provide a full range of customized solutions combined with our professional staff who are on-call and dedicated to your business success. Our combination of real-world experience, knowledge and the expertise of a large CPA & consulting firm uniquely positions us to deliver results that other firms can’t. Questions in regards to the hospitality industry? Our dynamic team of experts are here to help. Contact us today to schedule an appointment.